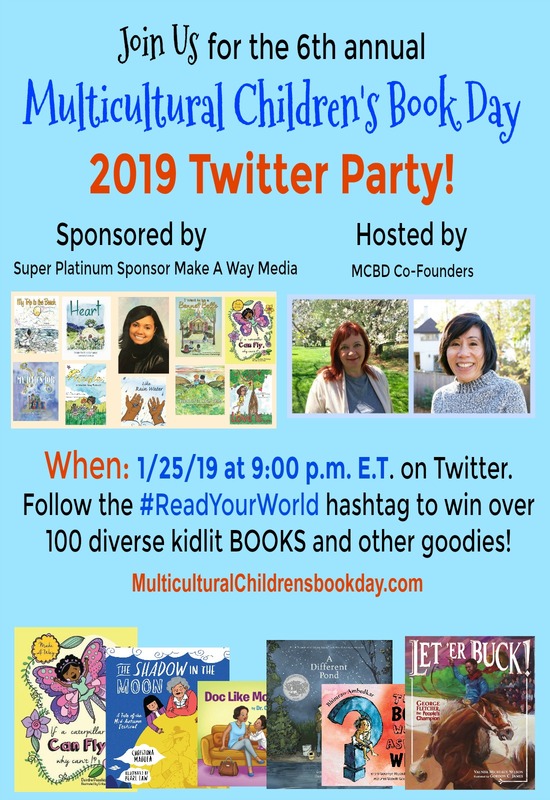 Readerbuzz: #ReadYourWorld: It's Multicultural Children's Book Day 2019! 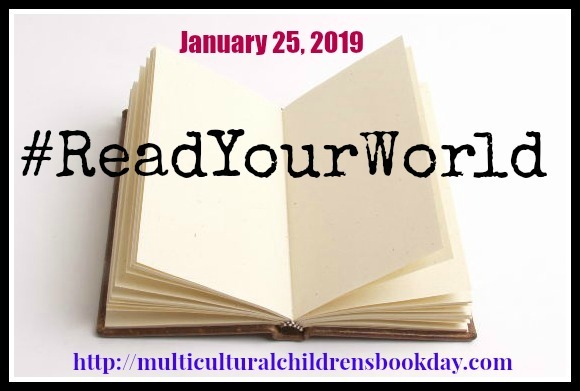 #ReadYourWorld: It's Multicultural Children's Book Day 2019! 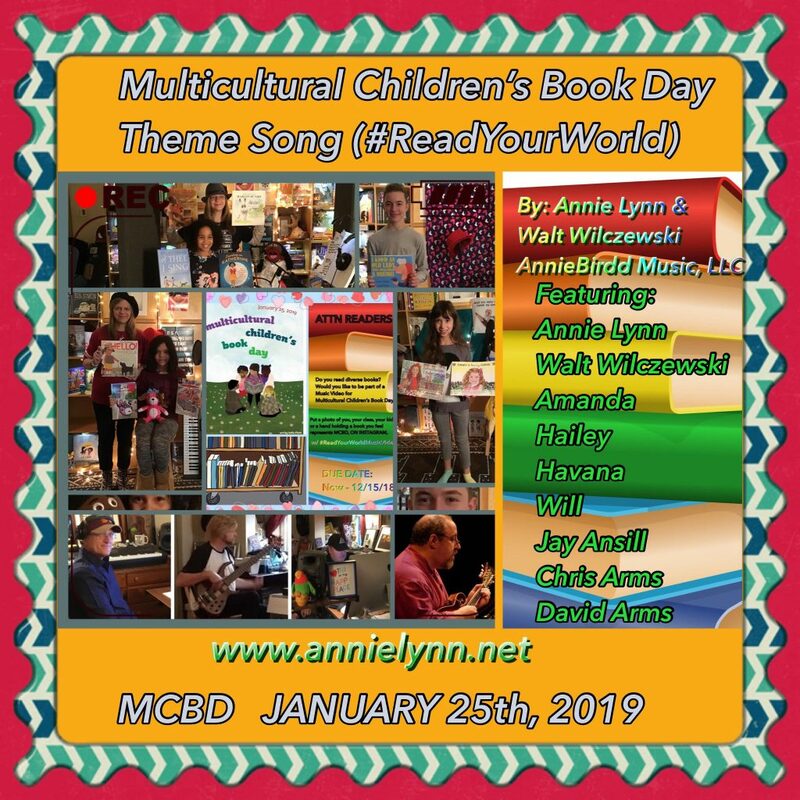 Multicultural Children’s Book Day 2019 is in its sixth year. It was founded by Valarie Budayr from Jump Into A Book and Mia Wenjen from PragmaticMom. The mission of Multicultural Children's Book Day is"to not only raise awareness for the kid’s books that celebrate diversity, but to get more of these of books into classrooms and libraries." What are multicultural children's books? Celebrating diversity is a huge part of my job as a book blogger, librarian, and reader. I'll never forget the first day I walked into my first library in Houston ISD, a school that was listed as over 80% Hispanic, with one third of the students enrolled in bilingual education. When I asked about books that were in Spanish, I was shown to a tiny section of three small bookshelves. How sad, I thought, and finding diverse books became my mission. My second school library is located in the Texas Medical Center and is exceptionally diverse, with over fifty different languages spoken in the home. Again, I sought out books that were in all fifty languages, a very challenging job. My third school library is in my hometown, and again I faced the job of finding books in Spanish for our large bilingual population. This school is a PreK-2 only school, and the importance of having many beautiful books in Spanish for young readers is critical. How happy I am this year to be asked to review two books for young children in Spanish and English! 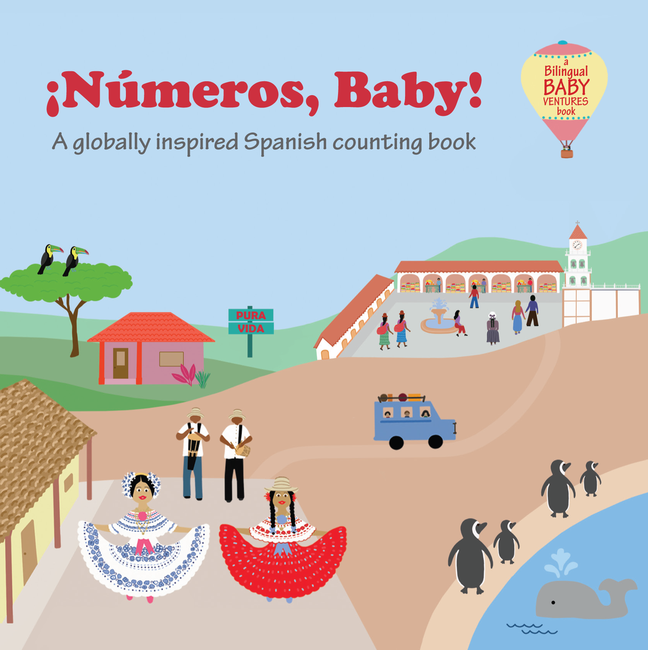 Travel around the Spanish-speaking world in ¡Números, Baby! by Lisa Hall and Golzar Kheiltash. 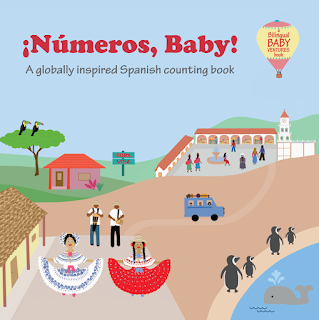 Every young child loves a counting book, and you couldn't find a more perfect counting book for young Spanish-speaking children than this. For very young children, the pictures and text work as an ideal book for counting in Spanish and English. For slightly older children, the pictures and text work as an introduction to Spanish culture around the world. In the book, children can experience intriguing sites and events in the native cultures of Peru (the Nazca Lines), Panama (Desfile de las Mil Polleras), Costa Rica (Parque Nacional Volcan Arenal), Bolivia (Salar de Uyuni), Puerto Rico, Mexico, Cuba, Guatemala (Festival de Barriletes Gigantes), Spain, and Argentina. All this in a little board book with only a few words of text on each page. Delightful! For more information on the book, take a look at the Baby Ventures Books website or Amazon. ¡Bienvenido al mundo bebe! opens with Tariq's mom having a baby,. Tariq is eager to share with his teacher and his class how the family celebrated the arrival of Tariq's new baby brother. 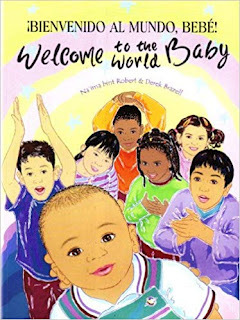 The teacher decides to use this experience as a jumping-off point for the class to share the ways their diverse families celebrated the arrival of new babies in their cultures. One girl brings a little red egg, and explains that the red color is an offering of good luck to a new baby. A boy shares an aloe leaf with the other students who taste the bitterness of the leaf, and then offers a pot of honey to the children who then taste the sweetness, a lesson to the new baby that life can be both bitter and sweet. Many other traditions are shared in the story, and readers can enjoy learning about the many ways new babies are celebrated around the world. As an added bonus, this book is available in twenty-eight different languages. Finding a story about the beautiful diverse traditions of welcoming a new baby into the world that is available in so many different languages is a delight. For more information about the book, take a look at Language Lizard or Amazon. Music Video: MCBD has its first ever music video! How cool is that? Thank you to Annie Lynn and Walt Wilcezewski for donating their time and expertise to create our first official Read Your World Music Video. View it here and you may see some familiar faces and books! I love multicultural children's books and always sought them out for my son. I’m glad that there are librarians who are dedicated to finding children’s books in many different languages. My schools always had a tiny selection of Spanish books, which is weird, considering how many students knew Spanish. 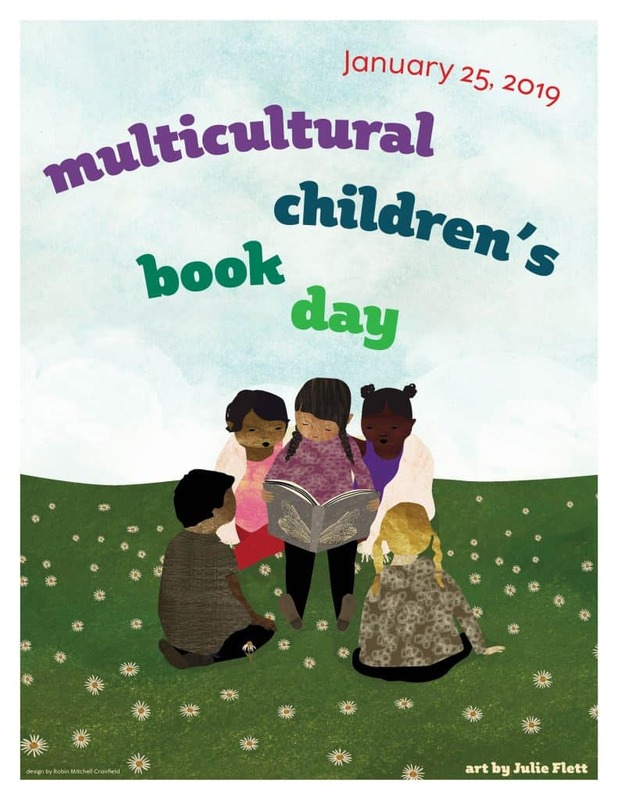 Your Multicultural Children's Book Day sounds fabulous! I first experienced a focus on diversity in the 60s, when I was living in San Francisco and did some field work in the Mission District. Of course there are many other parts of the city to explore, but it was a start. Enjoy the event...and your books. Thanks for visiting my blog. I love how you went out of your way to find books in different languages for your students. My library is starting to buy more and more books in various languages for our patrons. This is something my school needs to do better at. (And a reason why we NEED A CERTIFIED LIBRARIAN, but that's a whole 'nother soapbox.) Thanks for sharing this sweet titles. Thanks for supporting Multicultural Children's Book Day! What a project. Have fun! Your lifelong coommitment to multi-cultural children’s books is fascinating. When I was a child all we had were some. very inauthentic books about twins in a number of countries. Nothing about the children who were actually in school. Obviously the types of books you are finding would be good for all children, not just the members of each group separately. Yes to celebrating diversity in reading, it's so important especially for kids to be able to connect to characters and to learn from them as well. Great post! Happy reading. Great project. Yay to multicultural books. Finding diverse books is certainly easier now than when I began as a Media Specialist. I never worked in a district with more than a handful of kids from other cultures though. Come see my week here. Happy reading! This is wonderful! Thanks so much for sharing.